Bruce Lee reborn? 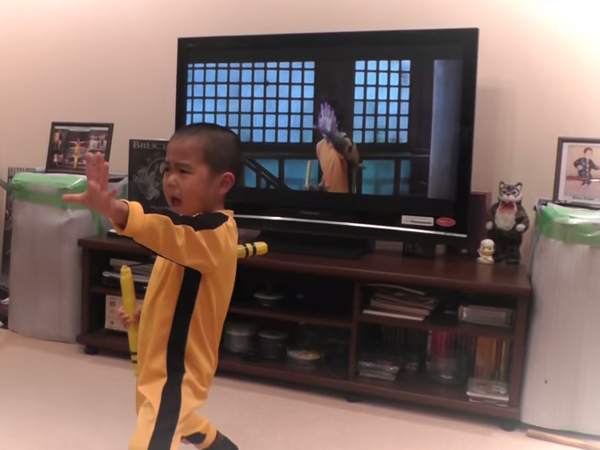 Watch this 5-year-old internet sensation fight like a master! Forget Pacquiao and Mayweather, this 5-year-old’s incredible fighting skills could give us all a run for our money! In the viral YouTube video, Ryuji Imai, from Japan, can be seen perfectly re-enacting Bruce Lee’s famous fight scene from the 1972 film, Game of Death. Posted by his father, the video also shows the 5-year-old is wearing a child-size version of Bruce’s iconic yellow-and-black track suit and his own pair of nunchakus. The video has gained more than 5 million views since it was posted on the site on 1 May. We wouldn’t want to mess with this kid!